صالح پور, شوبو, طارمیان, اصغر. (1393). اثر روش چوب‌خشک‌کنی بر ضریب نفوذپذیری چوب بلوط (Quercus infactoria). مجله صنایع چوب و کاغذ ایران, 5(1), 1-9. شوبو صالح پور; اصغر طارمیان. "اثر روش چوب‌خشک‌کنی بر ضریب نفوذپذیری چوب بلوط (Quercus infactoria)". مجله صنایع چوب و کاغذ ایران, 5, 1, 1393, 1-9. صالح پور, شوبو, طارمیان, اصغر. (1393). 'اثر روش چوب‌خشک‌کنی بر ضریب نفوذپذیری چوب بلوط (Quercus infactoria)', مجله صنایع چوب و کاغذ ایران, 5(1), pp. 1-9. صالح پور, شوبو, طارمیان, اصغر. اثر روش چوب‌خشک‌کنی بر ضریب نفوذپذیری چوب بلوط (Quercus infactoria). مجله صنایع چوب و کاغذ ایران, 1393; 5(1): 1-9. Rezanejad, A. and Firozjaii, H.A., 2007. 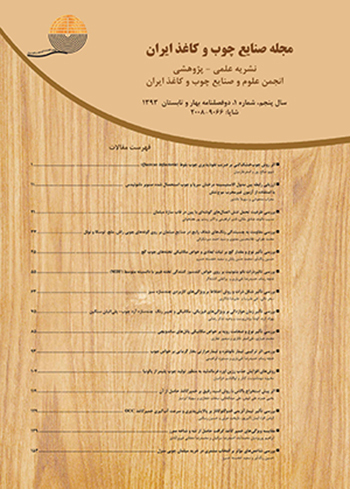 Study on termites resistance of oak wood by field test stakes, Iranian Journal of Wood and Paper Science Research 22(1): 62-71 (In Persian). Rezanejad, A. and Arabtabar Firouzjaei, H., 2010. Study on Durability of Oak Wood by Field test stakes, Iranian Journal of Wood and Paper Science Research 25(1): 22-31 (In Persian). Aloui, A., Ayadi, N., Charrier, F. and Charrier, B., 2004. Durability of European oak (Quercus petraea and Quercus robur) against white rot fungi (Coriolus versicolor): relations with phenol extractives, European Journal of Wood and Wood Products 62(4): 286-290. Gholamiyan, H. and Tarmian, A., 2010. Radial variation in longitudinal permeability of beech wood containing red heart wood, Journal of Forest and Wood Products 63(1): 37-46 (In Persian). Siau, J.F., 1984. Transport processes in wood. Springer, Berlin, Heidelberg, New York, 245p. Zhang, Y. and Cai, L., 2006. Effects of steam explosion on wood appearance and structure of sub alpine fir, Wood Science Technology 40: 427–436. Alexio, U.P., Wilkins, N.A.P. and Hartley, J., 1990. Effect of pre-steaming on drying rate، wood anatomy and shrinkage of regrowth Eucalyptus pilularis SM, Wood Science Technology 24: 103-110. Torgovnikov, G. and Vinden, P., 2009. High-intensity microwave wood modification for increasing permeability, Forest Products Journal 59(4): 84-92. Simpson,W.T., 1991. Dry Kiln Operator’s Manual, United States Department of Agriculture Forest Service, Forest Products Laboratory, Madison, Wisconsin, 269p. Taghiyari, H.R., Parsapajouh, D., Karimi, A.N. and Pourtahmasi, K., 2008. Study on gas permeability of juvenile wood and mature wood in Populus deltoids (69/55) and Populus × euroamericana (cv. I-214), Grown in Gillan Province, Iran. In: Proceedings of The Second National Congress on Poplar and Potential Use in Poplar Plantation. May 5-7, pp. 133- 140.